Twelve hours later, well, closer to fifteen, I'm somewhere in Nakano for another performance. Nabeyoko typically is not one of the more challanging ones, though it does tend to be very hot. As per usual, most of our members sat around and enjoyed the festival during the afternoon, but I decided to skip that part this time due to a combination of being really really tired, wanting to spend slightly more relaxed time with my daughter, and giving my liver a break. There's only so many times you can turn down free beer in a given afternoon. So, we start getting ready around six in the evening. There are no changing rooms for the men, so we have to make do with a back street, same old same old. Nothing unusual to report there. We begin at one end of the street and parade to the front of the shop we changed behind—the owner used to perform with us on drums, and he is instrumental in getting us involved each year. There we performed a set piece before continuing up the road, turning round, coming back a way, and performing a second set piece. Easy. The second set piece it was decided would be performed at 90 degrees to our usual style, so we were facing down the road rather than off to one side. What this meant was that we now had a relatively narrow, but very deep space to perform in. Not a problem, providing everybody has some sense of spacial awareness and can visualise the world in three dimensions. Or in other words, a problem. But we grinned our way through it, even when a local store owner, presumably, started banging a giant aluminium can with a ladle, which was a lot more distracting than it sounds. Staff told him to go away in no uncertain terms, but he was back a few minutes later doing the exact same thing again. I'm not vindictive by nature, so let it be known that I harbour no animosity, and wish no vengence upon him—an eternity of wailing and gnashing of teeth, for example—at all, whatsoever. Something had, however, been bothering me the whole evening. In fact, it had been bothering me the previous evening too, and the previous week. The "Enbun Charge" salt tablets I'd found most effective in preventing dehydration did not seem to be having the usual desired effeect I'd come to rely on, and it had been having an adverse effect on my performance skills. A closer inspection of the package was simultaneously a relief and a horror. I'd bought the wrong ones. These were "Enbun Plus", a competing product in a superficially very similar package. That'll teach me to just grab them off the shelf without looking properly. The rest can go in the bin then, and I'll make sure I'm stocked up on the real deal in time for Koenji in three weeks time. I'll be sitting out Shimokitazawa on 20th due to family commitments. As previously mentioned, this promised to be one of the more interesting performances behind the scenes, as we'd made the decision well in advance that we would both perform and leave our precious bundle of joy and dribble in the good hands of somebody else—a good friend and advocate for ethical Awa Odori photography volunteered to sit this one out on our behalf, and the rest as they say is history. The day started normally enough, at whatever time in the morning little'n decided to get up, which typically is around the same time the sun does. Fast forward to about 2:30 in the afternoon and we're no closer yet to even starting to get ready for the evening, so we divide into shifts. One of us looks after little'n while the other gets ready, and vice versa. Run to toilets, get her nappy changed and into new clothes, fifteen minutes later she's asleep again and all is well with the world. Except she hasn't eaten, and nor have we, and we've only got a few minutes left. Also I have a big wet patch down the front of my costume, but nothing that will stain, I'm sure, and what are the odds that anybody will even notice? * As I'm sure the suspense is simply killing you, let me reassure you now that the wet patch did not stain, and nobody at all noticed. Or if they did, they were polite enough not to say anything. The distinction seems to matter much less now that it would have done a year ago, funnily enough. It's time to head out, and friend assures us that everything will be fine, so off we toddle, anything but convinced. We've only ever left her in the hands of immediate family members (plural) before, and never for more than an hour. Needless to say, it didn't take long for us to forget all about that as we got into the spirit of the festival. Hold on... As you might recall from last year, Nakameguro is the one that has the really really long uphill parade ground that always kills us! Well, we did that one twice. The lack of food soon takes its toll, but it's nothing we haven't done many many times before. We only nearly collapsed of hunger, thirst and heat exhaustion, and muscle fatigue several times. Easy stuff. Some members of other teams were not so fortunate and had to leave in an ambulance. Finally back at HQ, we see little'n waiting in the corridor in friend's arms with charm aura turned up to 11, waving cheerfully to all the nice performers from all the other teams. Turns out she slept through most of it, and then greedily gobbled up enough food to feed a small pig. So she was in a good mood! Actually we all were. It was a good experience for everybody, and the help was much appreciated! Little'n went straight off to sleep again when we got her home, and we followed suit, whether we intended to or not. Next festival we'll both be performing in is in October, but for me, it's in about 12 hours time at Nabeyoko. 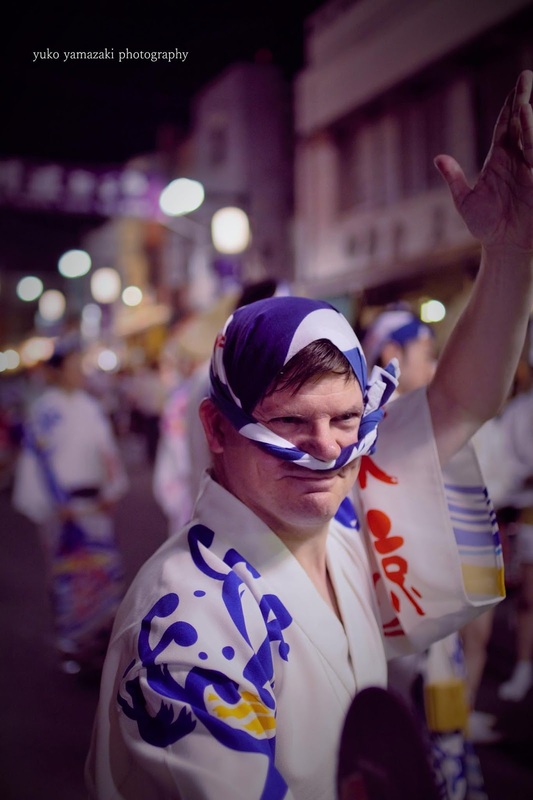 Kitamachi Awa Odori is always met with a mixture of excitement and dread. The excitement comes from the not unreasonably long parade grounds that are sufficiently wide to allow a full range of theatrics, and the enthusiasm of the crowds who are actually really there to enjoy the event (as opposed to being merely inconvenienced by it as they make their way home). Add to that the large number of high level teams, and what could possibly go wrong? The weather. Almost invariably, it is hot enough that people suffer heat stroke or dehydration, and I reminded my new members on several occasions leading up to it that they need to take active precautions against both in advance—if you feel thirsty/dehydrated/sick before you even begin, which is a very real possibility, then you're not going to have a good time. And if you collapse of boiled brain during a performance, then nobody else is going to either. When it isn't overly hot, it gets rained off by a freak rain storm that appears out of nowhere and drenches everything in seconds. This year was not such a year. It was hot, sure, but there was a cool breeze and the humidity could certainly have been a lot higher. It was the kind of weather I felt confident we could cope with without anybody making themselves ill.
As per usual, we began with a set piece along the road near the station. Also as per usual, we had teams with ultra-loud percussion on either side of us, though the louder of the two was around a corner which shielded us from the worst. Despite this, any performers on the opposite side of the stage to our musicians could simply not hear, and were having to take cues by looking at other people's feet. This is unfortunately par for the course, and it's something that all teams have to contend with. Except, presumably, the really loud ones in question. I'm sure they do just fine, unless their dancers have an irrational fear of flutists for some reason. The parade portions followed, and went more or less without a hitch. No missing persons, no major roadblocks... On the contrary, we had to skip ahead at one point because too much of a gap had opened up ahead of us. Moving at speed is not one of our strengths unfortunately, so we could have handled it better, but it's nothing I'm going to complain about. And it was also nothing that the "judges" were going to complain about either. They saw fit to award us the curiously named "Hustle" award! I will not be fielding questions as to what exactly the prize was for at this stage. An honorary mention should be made of the outstanding job the local scouts did at one of the water stations. They served barley tea which was very tasty and very very cold, and did so more proactively than I've seen at any other event. They had people with trays of the stuff all the way up the road, offering it to us individually as we passed, so we didn't have to walk quite as far to be refreshed. It was hot enough that the extra effort they put in was very much appreciated! 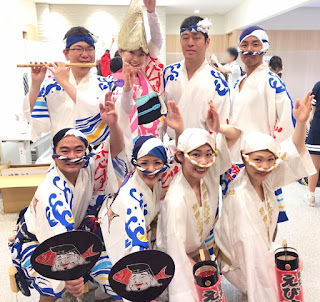 Next weekend has two festivals—Nakameguro on the Saturday, and Nabeyoko on the Sunday. Saturday should be something of an adventure, as we'll be taking little'un along for the ride. 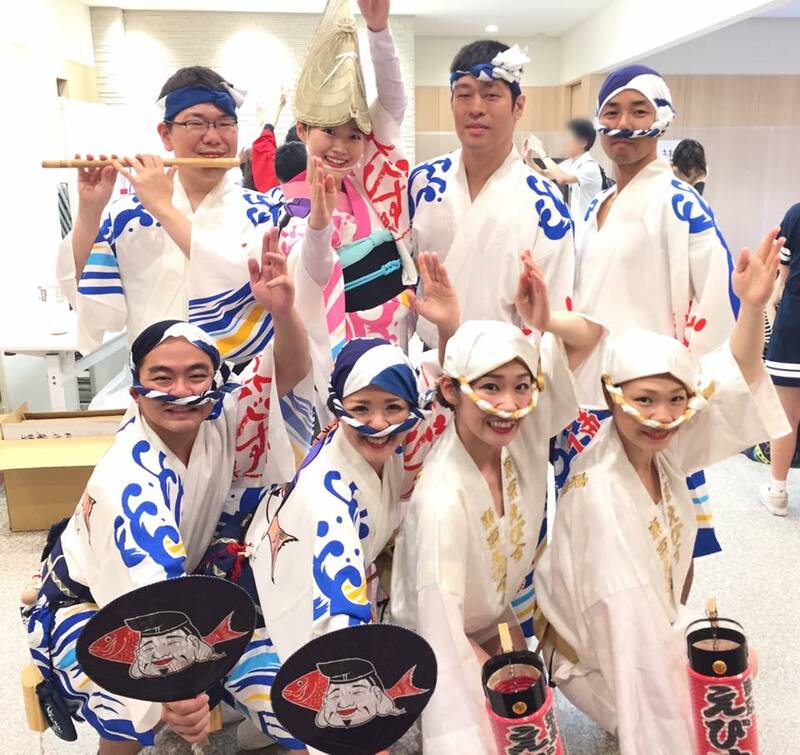 And with the blink of an eye, it's a year later and our first festival performance of the season, Kyodo Matsuri. This was quite a nervewracking performance for a number of people who aren't me, because no less than 8 new members were giving their debut performances. Admittedly, two of them had quite significant experience in famous Tokushima teams a long time since, but the rest were all new. Three of them were in my section, which meant that for most of the day I was needed constantly in a number of different places at once, which was made all the more tricky for one of them having spent most of the preparation time shut away in the women's changing area. 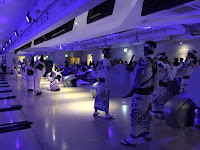 Still, the preparations went largely smoothly, including putting together the takahari, also known as a long bamboo pole with two giant paper lanterns at the top, the team's banner as it were. This sounds simple enough, but it's a 15 minute job for about 5 people, with 1 more person standing nearby "supervising". A former team captain likes to make a show of swinging the takahari around a lot during the parade portions, so the lanterns really need to be clamped down tight by a process that everybody manages to forget after nearly a year in storage. Like last year, and every other year before that, the performances were split into two parade strips which start at opposite ends of a long shopping street and meet in the middle, and a fully lit stage area for set pieces. The parade strip was also sectioned off later in the evening to be used for multiple simultaneous set pieces, where absolutely no consideration was given to the way the sound travels—it's very easy for a single team with a loud drum section to drown out 3 or 4 teams in each direction for the duration, and it happens more often than you might think. Still, that's part and parcel of the whole festival atmosphere. Our main set piece on the big stage was about 50 minutes into the festival, so we were sufficiently warmed up by then. Each of our three dance parts had many members present, and the practice we put into the choreography paid off well. We all moved very cohesively, with no missed cues and near perfect blocking, and the cheers coming from the audience were enthusiastic enough to let us know we were doing it right. Watching a video of it later, I have to say it's hands down the best public performance we've given to date. Let's see if we can keep that up for the remainder of the season. A common problem we have at Kyodo is that the parade grounds are very very narrow, and we really need the space to move. As such, we were heavily constrained and couldn't do anything fancy. The crowds seemed to like us anyway, but it would have been nice to be able to show them more. Heavy congestion also meant that we were unable to move forwards either, stuck on a spot for several minutes at a time. Being stuck on a spot is a common problem at a lot of festivals. When you have a 37 strong team moving around on foot through backstreets, it can be a job keeping people together. This became something of an issue on our second parade entry, as we needed to start moving and two essential musicians had disappeared. They turned up after what seemed like an eternity but was in fact about two minutes, and everything was fine—they'd needed to stop and make some adjustments to an instrument— but I've taken the precaution of sending out a memo to the effect, "When a performance finishes, go straight to the waiting area of the next performance ground and stay there." That will hopefully avoid us a repeat. All in all it was a good evening. There were no mishaps caused by new members which was no doubt an enormous relief to them, as it was for us also. Crowd reactions were almost entirely positive, including one old lady that approached me after our final set piece in tears thanking me for giving her some positive energy. Isn't that sweet. 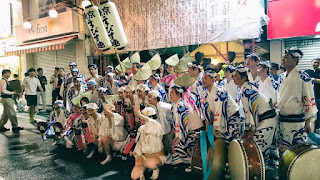 Next weekend is Kitamachi Awa Odori, which brings its own unique set of challanges, none of which are a lack of space to move. Update: Friend, Tokyo Ebisuren fan, and fantastic event photographer Takanobu Yanagihashi has put up an album on Facebook. My little girl is seven months old now, and what a seven months it's been! But nobody wants to hear about baby stuff when there's Awa business to talk about! Not sure how well known she is, as I don't follow Enka circles, but a high class function suite in a well known Nakano hotel overlooking the city was packed out, so I would say well known enough. It was so packed out, that our stage area was literally two square meters. Just as well we came light, with just two representatives from each dance part. Taken behind the scenes, for everybody's safety. This is a facility we perform at more or less anually. 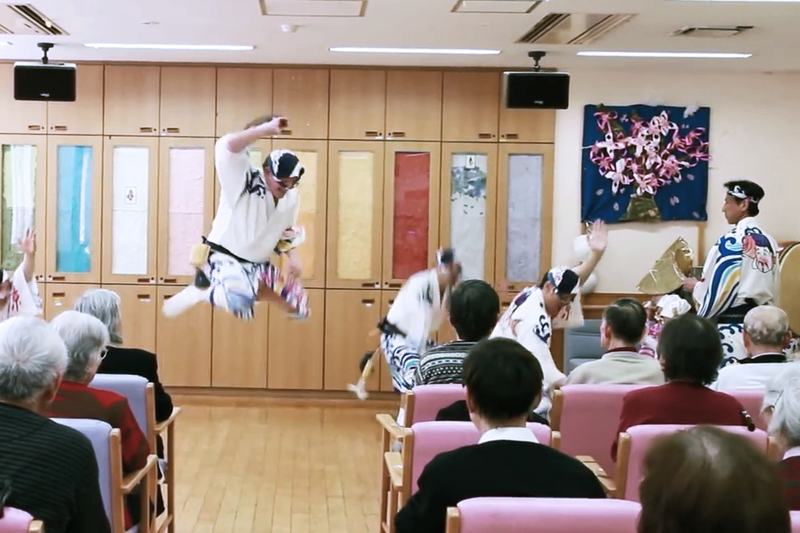 The audience is a large group of mentally handicapped young adults, some of whom enjoy sitting around, watching the performance, not jumping up and charging as quickly as they can in random directions without warning; others less so. The staff are very efficient, and can always be relied upon to grapple the more mobile guests to the ground at a moment's notice, before they end up flying straight out of a window, or getting their head stuck in a drum. As such, there is no need for us to worry about any of these things as we perform, despite the looming prospect that this time, it might be different. Overall a thoroughly enjoyable time for everyone involved! At a bowling alley. Really. Our stage was the area between the lanes and where the balls are returned, that bowlers use for runups. It's worth noting that the wedding was between two of our members, and one of them takes bowling very seriously. Unfortunately, I could not be present for this particular performance as my wife wanted to go, and taking little'un wasn't an option for reasons I could never quite confirm. This is another facility we perform at maybe once every two years. The second time I performed there, I was bitten by an old lady. I was lucky to get out alive! This time was much more fun, with a very chatty MC who made sure they got a whole hour out of us in a very very hot room. Nobody tried to eat me though, so I would call it an overwhelming success. Probably our most prestigious performance todate. This invitation was something of a mixed blessing as it was a good hour north of Tokyo on what was technically a week day, which made getting the members together quite hard. We also had to adapt our choreography to allow the finalists to perform along with us for a spell. On the plus side, we got to rehearse on the actual stage, which allowed us to block the formation properly so we weren't all over the place, as often happens when 20 or 30 odd people with no sense of direction try to coordinate their actions. On the minus again, the concert hall seated 2,500 people which was the cause of some considerable stress for certain members who weren't used to performing in front of an audience that size—this was not a problem for me, because I've long since mastered the art of pretending like a mistake was deliberate, and was confident nobody was going to be in the audience shouting "Hey, look! The white guy is the only one that's doing it wrong!" (He only heckles at Kabuki these days, and seems to fit right in there.) As it turned out though, the hall was far from capacity. That said, the event was also live streamed to well over half a million people worldwide, a fact that—thankfully for those feeling under pressure—was not revealed to us until after we'd finished. All in all a fun event to be a part of. In other news, we've had an influx of new members this year, especially in my section. Four people starting from scratch (or near enough) that have needed to be trained, with the threat of yet more looming, plus one very experienced member who puts the rest of us to shame—and about time too. On Sunday 8th, I held a workshop for the new members so they can experience first hand just how strict I am about the correct ways to put on a costume. Some even took notes. It brought a tear to my eye. All in all, a very busy season so far, with plenty more to come this summer! Look forward to seeing you all at Kyōdō in July! Hatsudai shares an unusual detail in common with the main Tokushima event that very few of the other Tokyo festivals do, and I've yet to work out exactly why that is. For some reason, it always takes place over the same two days, regardless of what day of the week they fall on. They're both public holidays, which helps of course. 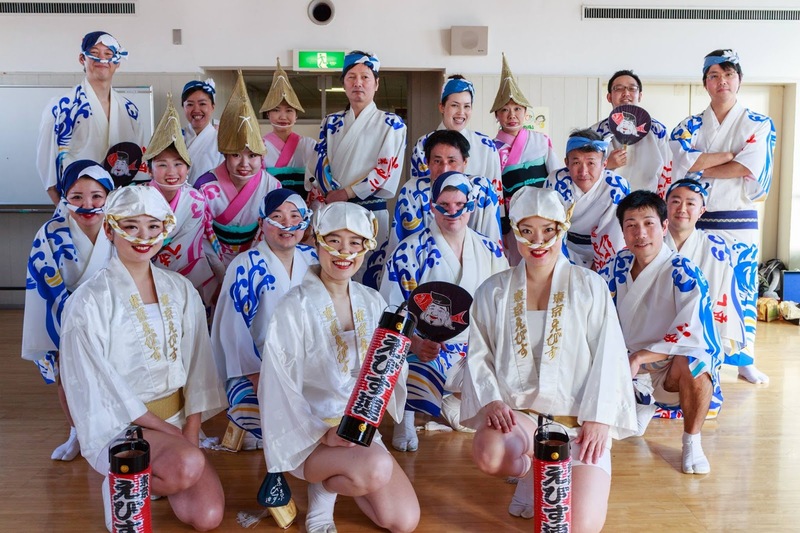 Unlike the main Tokushima festival though, it also uses a varient spelling of "Awa Odori" in the festival name, that you would need to really be on the ball to spot. The preferred spelling is "阿波おどり", whereas Hatsudai uses the more conventionally correct "阿波踊り". What's the difference? Well, to the branding conscious, rendering the "Odori" part in hiragana is the more pleasing choice, as it binds it inseperably to its "Awa" component, as part of a proper noun. Rendering the "odori" part in kanji + okurigana, like Hatsudai does, is the default for most text input systems, but it also serves to separate them into two distinct words of equal stature. The knock-on effect of this is that the preferred rendering really puts the emphasis on "Awa"—it's not just a dance, it's the AWA dance; the alternative rendering removes that emphasis, turning the "Awa" component into a mere adjective for a common noun—this is a dance from the province once known as Awa. The difference is very nuanced, very slight, and I'm not sure why we care so much about it. This one came out fine! Hatsudai is also fairly unusual in that it only has one performance space—a relatively long at 300 meters high street where all the performers begin at the top and end at the bottom, before returning to the top via the backstreets and doing it all over again. The road is fairly wide compared to similar festivals, which gives us a lot more room to move and swing our dead cats around. It's also lit by ten light poles which are in the middle of the road, which is fine if you're moving in two columns, but can cause logistical issues when moving in threes. Apparently they're a blessing and a curse for the cameramen—they provide a convenient hiding space that allows them to photograph from within the performance space without getting in the way (or being told to move by staff), but as the light poles have quite a high colour temperature compared to the rest of the lights, they often end up with blue foregrounds and orange backgrounds, or vice-versa depending on which direction they point the cameras. After the parade portion has finished, all the teams take up positions along the road, separated by the light poles, and perform a set piece for 15-30 minutes. This year we performed on the second day, and started two light stands from the goal line. That gave us a nice casual warm up, and also meant we didn't need to fight for our stamina while also giving our best performances. Our second run, which was from the top, was somewhat less easy. The teams in front by ripple effect were jammed solid, which kept us from moving for quite long periods of time. We ended up performing our parade set piece a total of six times in one run—three would be a lot under normal circumstances. Thankfully the weather was cool enough that nobody collapsed, but it was touch and go for a couple of people. The long time spent on the wide parade ground did give me plenty of opportunity to try out some new material though, which I think I have well polished now! Unlike the onna odori, otoko odori have remarkable freedom to individualise their dance, and this is something I like to take full advantage of. And while it looks fairly random, it's more a case of having a repertoire of patterns of varying lengths which I'll sprinkle into the regular dance as the feeling takes me. If people are never quite sure what you're about to do, it keeps the dance more interesting I find. However, it's important to distinguish between randomly selected patterns and actual randomness—the moves need to be both decisive and precise, almost like a series of carefully crafted poses, only the motion between them is of no less importance. And the key to this is practice, and practice with a critical eye! My new power jump is still a work in progress, so will return to that on another occasion. 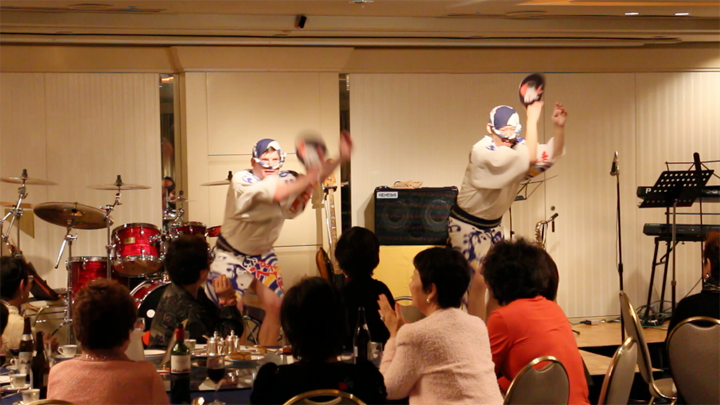 Well, that's the final Tokyo festival of the season for us anyway, but we still have more to come. 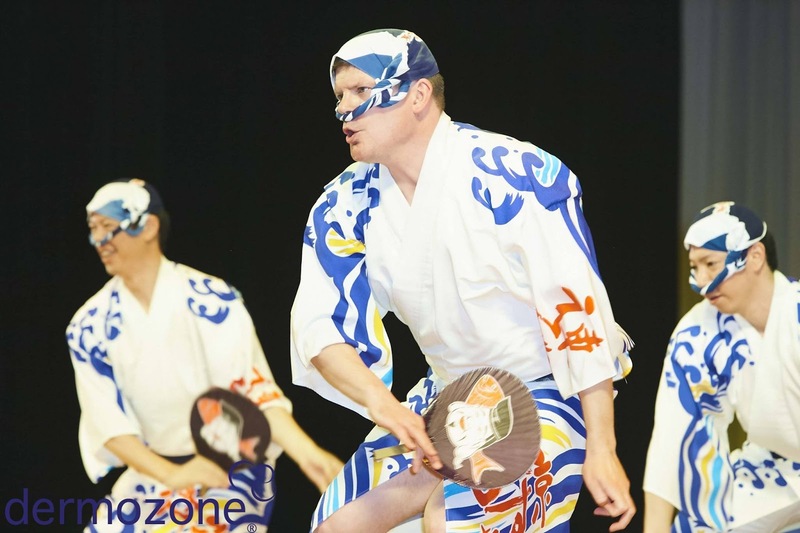 Next month we'll be performing at the Yoshiwara-juku Shukuba Matsuri down in Shizuoka. We also have a couple more volunteer performances in the pipeline to look forward to. While that's going on, we're finally resuming our practice schedule starting on October 3rd, and already have a number of new members eager to get started!